When we go to expos and comic cons (and we’re doing about 20 of those this year) we have a little sign on the table with our prices and a notice that says “ask us about our bundle deals”. The reason for this is fairly simple: comics are sequential and if you want to pick up a whole story arc at once we want to encourage that… so to make it easier for you we offer discounts based on how many story arcs you pick up at once. That hasn’t really been possible with our online store until now and we felt that was a little unfair so we’ve created a few pre-selected bundles specifically for the website. With each of them, we’ve tried to focus on value for money. The badges are an easy one – they sell for £4 per set of 3 but the bundle is only £6 for six badges. With the 7 Shades miniseries you can have the whole 4 issue story in ebook and physical formats for £17 – it would cost you £24 if you wanted to buy those individually. 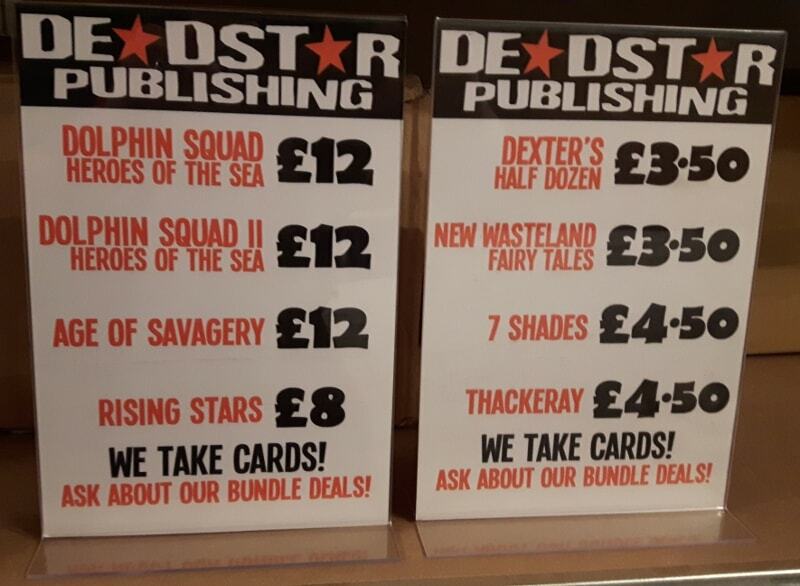 Our Dexter’s Half Dozen bundle gets you 296 pages of printed comics and the same in digital copies for just £30 compared to the £68 that would cost when bought individually. 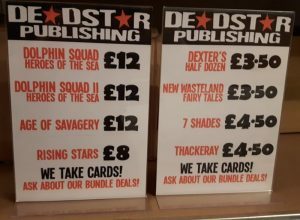 And with our Dolphin Squad bundle deal you’re getting three graphic novels, a poster, six badges and a whole host of downloadable goodies for just £30! Buying the three graphic novels on their own would be more than that. We’ve collected things this way because that’s what people usually ask for when they see us at conventions – but if you have other ideas on bundle deals that you’d like to see, contact us and let us know!